On Louis Proyect’s The Rhetoric of Anti-Imperialism and the European left. 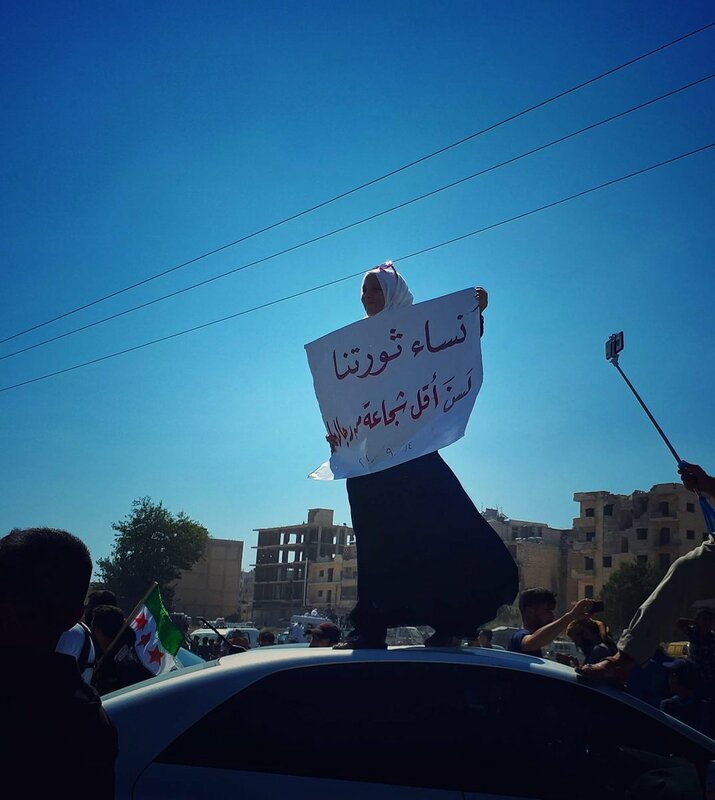 Idlib, Syria: Thousands protest peacefully against Assad’s war, Friday 14 September. Louis Proyect has just published this article (in Counterpunch), of significance not only in the US but for the European left, and across the word. On the Rhetoric of Anti-Imperialism. Beginning with an overview of “Rohini Hensman’s recently published Indefensible: Democracy, Counterrevolution, and the Rhetoric of Anti-Imperialism” it extends to a wider series of reflections. Project tunes into some of the key ethical and political problems, thrown up by a number of intense conflicts across the world since 2011 and the response of various parts of the left to them. In each of them the politics of an ‘anti-imperialism’, limited to opposing the ‘West’ (and de facto backing, amongst others, Assad’s regime, Putin and , though he mentions this to a much lesser degree, Iran) has been called into question. Rohini Hensman’s recently published Indefensible: Democracy, Counterrevolution, and the Rhetoric of Anti-Imperialism is an important contribution to the debate that has divided the left since 2011, the year that Syria became a litmus test. For some, support for Bashar al-Assad became tantamount to backing Franco in the Spanish Civil War while others saw my perspective as lending support to the USA, Israel, Saudi Arabia and other reactionary states carrying out the same neoconservative foreign policy that turned Iraq into a failed state. In other respects, he observes that on a range of social and economic issues the US left was united (“ranging from defending immigrant rights to opposing fracking),at the start of the decade. This could equally be seen here. The left (with at least some hope of a wider political influence than the US left, which was increasing after Ed Miliband began his Labour leadership) has in general terms been united on issues such as anti-austerity. This has parallels across Europe, although since that time the EU (UK) or sovereigntism has become dividing lines. It was during the Ukraine crisis that the same divisions over international issues, as in the US, became serious. There was (lightly covered) with support for Putin and the Russian Federation’s claims from the Morning Star, and the Stop the War Coalition (Counterfire-led) – a position not reflected so widely in the rest of Europe outside of the direct inheritors of the Stalinist parties – but also present. Lindsey German (Counterfire), Boris Kagarlitsky (Institute for globalization studies and social movements), Andrew Murray (Communist Party of Britain), Alan Woods (International Marxist Tendency) and Sergei Kirichuk (Borotba) discuss the threat of fascism in Ukraine, the role of imperialism in the current situation and the need for a campaign in support of the antifascist resistance in Ukraine to provide a counterweight to the lies and distortions of the Western media. Then there is the Middle East, where unity over opposition to the Invasion of Iraq began to crack, above all as the Arab Spring brought forth a movement for democracy against the Assad dictatorship. Proyect talks of Syria, the cause of whose people he has been a consistent champion. We are now in the final hours of the seven-year ordeal in which attempts to restore the democratic values of Hourani’s government have been crushed by overwhelming air power and massive intervention by Iran, Hezbollah and Afghan mercenaries. The looming victory against “imperialism” leaves the country in shambles with dismal economic prospects and inescapable environmental disaster. He continues, looking at the “campists” now backing, more or less openly, Assad. In Proyect’s conclusion he suggests that capitalists, and those states who wish for Assad’s victory, have their own interests at heart. One can only note that Louis’s belief that Boris Johnson is still UK foreign Secretary is one, amongst many reasons to doubt the emergence of such an alliance. And there is a leap from a certain support for Libya’s Hafter to….Assad, and Putin, Israel, Macron….. which is hard to jump. (“In July, Haftar met with an Israeli intelligence officer in Amman, to “deepen security coordination between him and Israel”. Not only does Haftar have these considerable forces in his corner, he can also rely on the backing of France’s President Emmanuel Macron and the UK Foreign Secretary Boris Johnson, as well as the United Arab Emirates.”). In all their heartfelt objection to imperialism, Assad’s supporters on the left seemed to have forgotten that Lenin wrote a book titled “Imperialism, the Highest Stage of Capitalism”. If you forget about the capitalism part of his analysis, you don’t get very far. One cannot imagine that Iran (whose capitalist rather than geopolitical and religious-ideological interest, if there is one, which it far from sure, goes unmentioned) and Putin’s Russian Federation, have backed Assad out of a wish to strengthen a multipolar world contesting American dominance purely out of hearty anti-imperialist good will. The extent to which religious ideology as a material force in the conflicts remains unclarified, but who can seriously doubt that it plays a substantial role in these wars. While one is certain that much of the US left, anxious at all times to distance itself from any hint of support for its own imperialist military machine, has good reason to be wary of its state’s involvement. 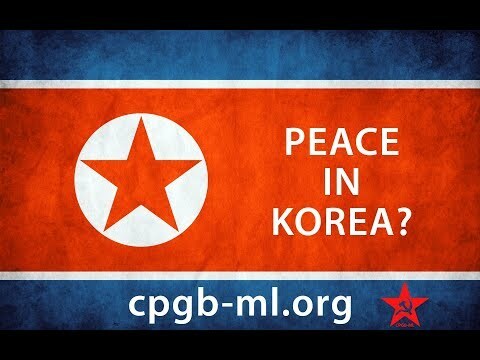 Communist Party of Britain-Marxist Leninist (CPGB -ML) and Stop the War Coalition on the Trump/Kim Jong Un Meeting. Comrade Brar put a strong and persuasive case in favour of the Korean people, their government and their hopes for peace and reconciliation on the Korean peninsula. Contrary to years of hysterical hyperbole demonising the north, its socialist system and its leaders, journalists in the capitalist press are now having to concede that the DPRK’s decision to arm itself with a nuclear deterrent was a wise one, and that the leadership of Comrade Kim Jong Un and the Workers Party of Korea (WPK) has been anything but ‘crazy’.For our part, we have always fully upheld the Korean people’s right to work for peace and reunification without outside interference. It is US imperialism that stands in the way of this strong desire of the masses of both the north and the south of Korea, not the DPRK government, which has long pursued a policy of striving towards reunification. This is closest we’ll get in Britain to the DPRK’s response. It is laughable but Harpel Brar is seen strutting around – unchallenged – on most London left demonstrations. Some on the left are more concerned with what they claim are “regime change” plans for North Korea than about the reality of this tyranny. But, until reality dictates otherwise, a nagging doubt remains that Washington — especially the plethora of neoconservative cold warriors surrounding the president — has something more sinister in mind. The likes of John Bolton and Mike Pompeo find it difficult to talk in anything but ultimatums, demanding “the Libya model” as the basis for Pyongyang’s agreement to renounce its nuclear weapons programme. While the global response to the meeting has been largely positive, Iran warned North Korea against trusting the US after Mr Trump recently pulled out of the 2015 international nuclear deal and reimposed sanctions on Tehran last month. What does the Trump-Kim summit mean? Not much, says John Rees. We may all welcome the retreat from earlier war-mongering rhetoric but this deal will not preclude it’s sudden return because there’s nothing of substance in it. Kim Jong Un must be laughing all the way to the DMZ. In a single bound he’s escaped from the dunce’s corner of international relations and now bestrides the world as, well, if not quite a colossus, then at least the admired ally of the most powerful head of state in the world. What Trump has actually done is to tear up a functioning nuclear deal with Iran and replace it with a meaningless multilateralist statement of intent with North Korea. China too will be relieved that any likely further pressure to contain their ally has just sharply decreased. The real lessons of the circus in Singapore are two-fold. One, this is another episode in the decline of US power. The initiative was taken out of US hands when North and South Korea began another round of détente at the Olympic games and it has never regained it. Trump has merely managed to grandstand on a stage that he neither created nor on which does he control the action. Two, the age of populist leaders is an age in which foreign policy goals are determined as much by domestic campaigning priorities as by traditional international relations strategy. US Presidents are supposed to at least make a show of pursuing goals agreed on by the entire foreign policy elite, otherwise known as the ‘national interest’. Trump isn’t interested in that, although he sometimes has that approach forced on him by the wider US power structure. If there is one thing more dangerous than a US President following the dictates of the foreign policy elite, as Bush did with the Project for the New American Century, it’s a President following his own mercurial interpretation of what viewers of Fox news think is a good idea. But that is where US economic decline wedded to overwhelming military power, plus the aftermath of defeat in Iraq, has brought us. In other words Trump is still a danger. North Korea, the DPRK, is a totalitarian tyranny. Yet, “Trump seemed to play down the severity of human rights violations in North Korea. “It’s rough,” Trump allowed after being asked about North Korea’s human rights record. He then said: “It’s rough in a lot of places, by the way. Not just there.” (Kim Tong-Hyung). We did not expect the CPGB (M-L) to mention this either, but Rees, acting as a chess strategist on the world stage, fails to tackle the issues which the New York Times has just summed up as “Atrocities Under Kim Jong-un: Indoctrination, Prison Gulags, Executions”. Perhaps these are more important than the “decline of US power. On the DPRK some parts of the left have a serious analysis. Shiraz reposts a piece from the US Socialist Worker by David Whitehouse. It says, “During a period of famine in the 1990s, Kim’s father looked the other way while Northern citizens developed private markets for farm produce and other goods. If Kim Jong-un really shifts resources away from military investment, North Koreans can look forward to making even more money from their private efforts.Meanwhile, soon after coming to power in 2012, Kim embarked on structural economic reforms that provide freedom to managers at the enterprise level — freedom to hire and fire at will, set wages at variance with national guidelines, and cultivate their own suppliers and buyers without going through the national planning process. These reforms, which mirror the early measures of Chinese economic liberalization in the 1980s, have promoted the development of a new middle class, at least somewhat independent of the ruling party hierarchy. This group definitely has an interest in Kim following through with diplomatic engagement that can open the economy even further. North Korea’s working class is overwhelmingly poor. Anecdotal reports, including from asylum-seekers who make it into South Korea, suggest that workers harbor intense hatred toward the rich upper layers of the party hierarchy and toward residents of the city of Pyongyang, where wealth is concentrated. Kim wants to keep it that way. The burden of domestic expectations has helped drive him toward the Singapore summit, where he hopes that de-escalation of hostility with the U.S. will bring relief from sanctions — and open up export possibilities, access to international finance, and investment from countries such as China and South Korea. If Rees suggests that ‘populism’ is now the engine of US foreign policy, does this mean that Trump tore up the Nuclear deal with Iran to please Fox News watchers? What exactly does the term American imperialism mean if instead of “military industrial” interests we have crowd pleasing as the motor of decision-making? Does it mean that ‘anti-imperialism’ now signifies fighting the mob and its leader’s “sound and fury”? Opposing the Air Strikes on Syria; Solidarity with Democratic and Progressive forces against Assad. It is far from clear what is the best position to take faced with the hecatomb of the Syrian civil war. Few can reasonably argue that a few military strikes are going to end the horrors, or that a full-scale invasion is either about to take place, or would help anybody. If a sentence could sum up the stand of many of us on the left it’s the one put forward by the group Socialist Resistance. Don’t bomb Syria – No support for Assad. As Joseph Daher points out: The butcher Assad’s regime is “a despotic, capitalist and patrimonial state ruling through violent repression and using various policies such as sectarianism, tribalism, conservatism, and racism to dominate society”. No socialist can support it. But neither can socialists support imperialist intervention against it. A US led coalition could only bring the regime down by sending in large numbers of troops, a move that would condemn the country to a worse hell than that inflicted on Iraq, in a regional and political situation which is even more volatile. The regrettable fact is that the secular and democratic forces which tried to bring down Assad have been seriously weakened, benefiting the Islamic fundamentalist and jihadist forces on the ground. A settlement based on aggression by the French, Americans, British and their regional supporters will do nothing but create a worse sectarian and ethnic bloodbath. How should the internationalist left respond to calls from some Syrians and Kurds for assistance from the United States military? There is definitely no easy answer, especially when people are getting massacred on one side and, on the other, the USA has no willingness of any regime change in Syria, as has been the case since the beginning of the uprising, or, as we saw, to stop the Turkish intervention against the Kurds in Afrin. Today the main issue is really demanding the end of the war, an end to all military interventions and guaranteeing rights for the civilians. I expanded on this issue in the last question. However, while disagreeing with groups demanding military interventions, we should still maintain our solidarity with all the democratic and progressive forces in Syria as well as the Kurdish socialist and democratic forces that resist against the two actors of the counter revolution: the Assad regime on one side and the jihadist and Islamic reactionary forces on the other side. From this perspective, what we can argue is that it is necessary to defend a local dynamic of self-defense rather than increasing the stranglehold of imperialism, and therefore we should also support the provision of weapons and arms to these democratic forces in the region to combat both counter-revolutionary forces. These are important element that could empower the democratic and progressive forces on the ground and give them the tools to defend themselves. This does not mean of course that we are uncritical of the leadership of these groups that have such demands, and we should maintain our independence and critical opinions, even when dealing with them. We have to be clear that imperialist actors and regional powers all act according to an imperialist logic that maintains authoritarian and unjust systems. They all oppose the self-determination of the peoples of the region and their struggles for emancipation. Hence, anti-war activists whether in the Middle East or the West need to address all forms of repression and authoritarianism, and condemn all forms of foreign intervention against the interests of the people of the region. What are some direct actions that anti-fascists and anti-authoritarians can take in solidarity with the Syrian people, including those being massacred in Ghouta, Idlib, and Afrin? Multiple things should be done. I think anti-fascists and anti-authoritarians should call for an end to the war, which has created terrible suffering. It has led to massive displacement of people within the country and driven millions out of it as refugees. The war only benefits the counterrevolutionary forces on all sides. From both a political and humanitarian perspective, the end of the war in Syria is an absolute necessity. Likewise, we must reject all the attempts to legitimize Assad’s regime, and we must oppose all agreements that enable it to play any role in the country’s future. A blank check given to Assad today will encourage future attempts by other despotic and authoritarian states to crush their populations if they come to revolt. We have to guarantee as well the rights of civilians within Syria, particularly preventing more forced displacements and securing the rights of refugees (right of return, right for financial compensations in case of destruction of their houses, justice for the losses of their relatives, etc.). Assad and his various partners in the regime must be held accountable for their crimes. The same goes for the Islamic fundamentalist and jihadist forces and other armed groups. We need to support the democratic and progressive actors and movements against both sides of the counterrevolution: the regime and its Islamic fundamentalist opponents. We have to build a united front based on the initial objectives of the revolution: democracy, social justice, and equality, saying no to sectarianism and no to racism. We of course need to oppose all imperialist and authoritarian actors intervening in Syria. One theme that has caused great concern on the left is the absence of any clear condemnation of Assad from the main anti-war groups. 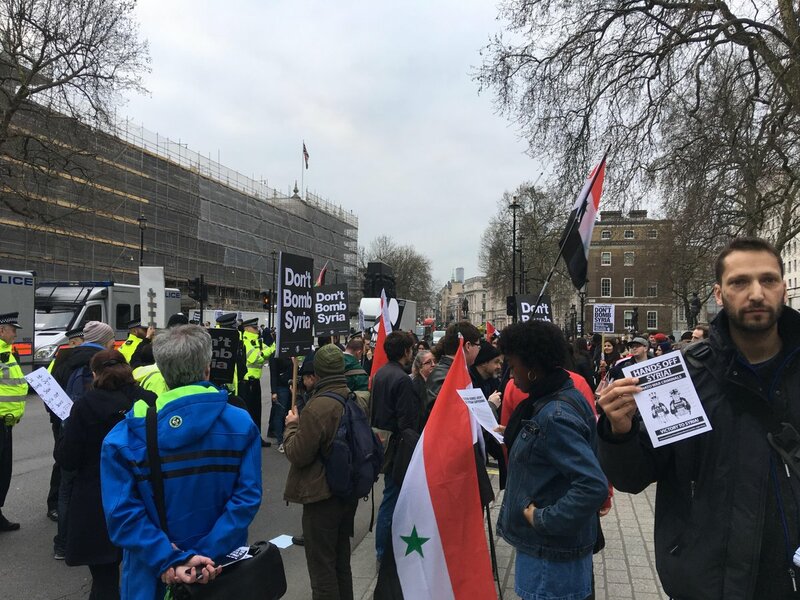 Supporters of Counterfire, a split from the Socialist Workers Party, which has paddled in the ocean of revolution but found its home in the safer pond of British pressure group politics, occupies leading positions in the Stop the War Coalition (StWC). Lindsey German is a member of Counterfire and the national convenor of the Stop the War Coalition. The StWC claims to oppose Assad. But her most recent article on the anti-war movement does not find the time to mention “the butchery” of the Assad regime” once. A primed anti-war movement finds the new warmongers much the same as the old warmongers, writes Lindsey German. The strikes carried out by the US Britain and France this weekend have achieved nothing in terms of stopping the suffering of the Syrian people or of making the world a safer place. They are purely a gesture to show that western imperialism can ‘punish’ Russia and Syria, and to help determine the outcome of the war in Syria. Western imperialism has no clear strategy except more lashing out with little purpose – which is the net effect of this latest attack. The unintended consequence of the war in Iraq has been the strengthening of Iran. The failed strategy of regime change in Syria has also strengthened Iran. So now Iran will move to centre stage. Donald Trump has appointed advisers, especially Secretary of State John Bolton, who are neocon hawks determined to overthrow the Iranian government. Next month Trump wants to move the US embassy to Jerusalem and to tear up the Iran nuclear deal – both likely to prove major flash points in the Middle East. And Russia? Politicians and commentators are sighing with relief that they have managed to pull off a strike that was weak enough to avoid direct conflict with Russia. But the tensions between the powers are worse than at any time since the Cold War, and we have nuclear powers involved in clashes in a cockpit of war. We live in dangerous times and this strike just made them more dangerous. The StWC and Counterfire mix late 19th century British radical opposition to costly overseas adventures and a crude Leninist focus on Western imperialism (and what is Russia’s involvement? ). They take the world as a kind of chess-board in which they attempt to thwart the moves of certain – imperialist – players. The Morning Star even evokes the sacred Sovereignty of Nation States, that is, Syria, against the Western powers interventions. The ‘main enemy’ is at Home, that is, one assumes, not a call to civil war to overthrow the Tories, but to vote them out of office. The main appeal to a mass audience appears to be the objective of making “dangerous times” less dangerous. We shall leave aside the -minority – role of Assad apologists, such as George Galloway and – inching in that direction – Giles Fraser, and others, who have long been hitched to the StWC wagon. Yet they ignore “solidarity with all the democratic and progressive forces”, showing no activity, other than a few words, in defence of the Kurds, and none whatsoever for democratic movements opposed to Assad. Can there be a peace without justice? Having shouted about Islamophobia at the slightest opportunity they show no concern for the fate of the Muslim victims of Assad’s terror. Common purpose has brought democrats and the left together in opposition to blood-stained tyrannies. There is no separate British ‘homeland’ to that struggle. The Baathist rulers of Syria, their Islamist allies from Iran and Lebanon, the Russian state, are not a ‘camp’ standing against ‘imperialism’. They are as much the enemies of that common home as Trump and his allies. Oppose the Attacks on Syria, Oppose Marching with Assad Supporters. Can the left March with Assad Supporters? You be with Al-Qaeda Jaish-al-Islam (Army of Islam) and ISIS if you like. I stand with Syria against them. All righteous people will do so. You bombed before your inspectors even started work, fully exposing your mendacity. You hadn’t the guts to put it to your parliament. ENDS. Iran, the other prop of Assad with Putin, is a theocratic Islamist dictatorship with a blood-stained record. Its own militias (Islamic Revolutionary Guard Corps–Qods For) and Lebanese allies, Hezbollah, are fighting for their own religious and political interests. Russia claims it has ‘irrefutable’ evidence chemical attack was staged by foreign intelligence. Foreign Minister Sergei Lavrov told a press conference that an unnamed country was leading a campaign against Russia. “We have irrefutable evidence that it was another staging and the special services of a state which is in the forefront of the Russophobic campaign had a hand in the staging,” he said. Russian Defence Ministry spokesman Igor Konashenkov accused Britain of staging the attack. “We have … evidence that proves Britain was directly involved in organising this provocation,” he said. Mr Lavrov warned that a strike against Syria risked a similar outcome to previous wars in Libya and Iraq. Not to mention this a few days earlier. 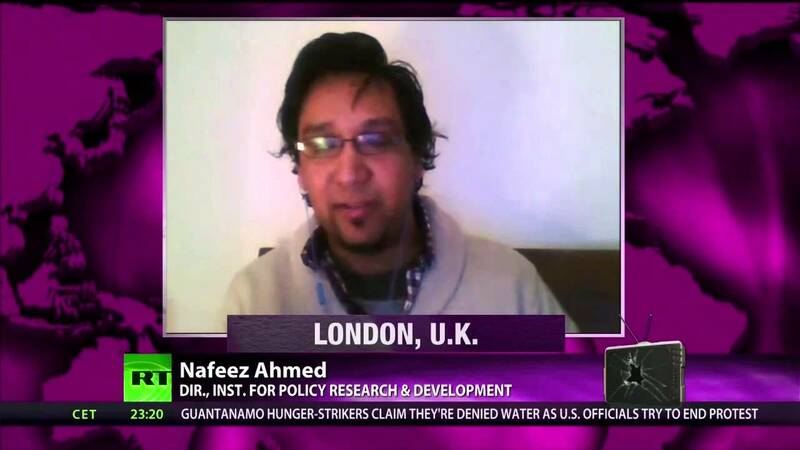 Stop the War Coalition cites 9/11 Truther Nafeez Ahmed to Explain Crisis with Russia. The Stop the War Coalition (StWC) asks, Has the West Provoked the Crisis With Russia? WRITTEN BY CHRIS NINEHAM ON 16 MARCH 2018 . The Newshounds of the StWC have found the answer: Yes. Who is this chap Nafeez Ahmed? And what did this Newshound find out? Here are some more of Ahmed’s recent ‘investigative journalism’. According to former British diplomat Craig Murray, for instance, it is more reasonable to cast the net of suspicion onto Israel for many of the same reasons cited by the British government. The fact that the government chose, instead, to shut down all avenues of inquiry other than to claim falsely that the “only possibility” is for all roads to lead to Russia, demonstrates that we are almost certainly in the midst of a concerted state propaganda operation. Let us go a little further back into Ahmed’s past. the pre-9/11 intelligence failure was not simply because of a lack of reliable intelligence, or because intelligence bureaucracy was hopelessly incompetent (which it was and is), but ultimately because the Bush administration made political decisions that obstructed critical intelligence investigations and ongoing information-sharing that could have prevented 9/11. Those decisions were made to protect vested interests linked to US support of Islamist extremist networks like the Taliban and their state-sponsors, such as the Gulf kingdoms, rooted in Western oil dependency and intersecting financial investments. The inadequacy of the 9/11 Commission investigation, in this regard, is an open secret to many intelligence experts. Apart from the dubious method of citing the above Ahmed as an authority, with all his hints about UK government skullduggery, it is hard to see how the document the StWC relies on, concerning “great power manoeuvring” proves anything whatsoever about the Salisbury poisonings. Still less that this is part of a plan for “destabilising and undermining Russian power” and “regime change”. Such are the political straws the StWC is clutching to these days.